As a writer, Its important to have goals. Milestones that represent our accomplishments in the various avenues of our life. Whether it is work, our health or travel planning. Invariably when I set a goal – I break out my Franklin Planner and write tasks down to complete said goals. If I’m writing I’ll set so many words per day. I have stickers, different colored pens, highlighters and flags to keep track of everything. If I complete the task, I check it off. If I miss I put a Red X through it. Like its an epic fail. I often wonder are the tasks as important as the Goal. My argument would be, “Yes.” Most tasks I assign myself are for some sort of Goal. Whether that is completing a book, or planning a retreat. I don’t tend to reward myself for the tasks, but aren’t they in, and of themselves, mini goals? Shouldn’t I spend some time rewarding myself for even writing once during the week? As I grow more as a writer, and person, I realize that these tasks are just as important as the goal they are propelling me towards. Even if most days I’m more like the turtle in the race versus the hare. This entry was posted in Blog and tagged #atozchallenge, Goals, Planners, Tasks. Bookmark the permalink. I have big goals and daily goals. My daily goals tend to be making progress towards a bigger goal. Say writing 300 words on my latest project or moving for 90 mins each day (probably not quite enough but better than nothing). I’m intrigued by your franklin planner, I tried a new diary/ planner this year but it’s not been a success. I vote YES for the Gold stars AND rewards. 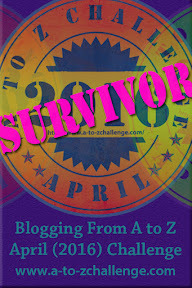 Great post and pictures, Enjoy the rest of the A to Z Challenge!